Imagine the situation. You've just started up a high-end hi-fi company. Your country is semi-detached Eastern Block with all that implies re education and technical ability. The wall comes down, EEC membership seems a distinct possibility, distribution is set up in Europe and sales begin to go well, then - chaos. Civil war, sanctions by the West, cruise missiles overhead, revolution, national strikes etc… It could only be one place - Yugoslavia. And yet through all this the company in question - Korato - kept going. As I write a Korato pre/power is making sweet music (if 'June 1974' can be called that) looking like a mainstream European product, and I still find it hard to believe. At a time when European manufacturers seem to be dropping like flies their problems seem as nothing compared to what Korato has weathered and survived. Small they may be, but tough and resilient they surely are and that as much as anything else gives me faith that they are here to stay. Now with the future looking more promising they are planning another move into Europe and the US. 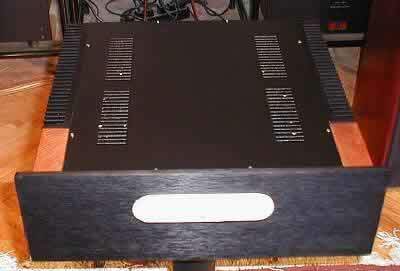 Korato's weapon in their new drive for export is the KVP10 preamp and KTA100 poweramp. First the poweramp. This is of the monster class, 28 kgs, huge alloy heatsinks down each side and big with it. It's heavily biased to class 'A', managing 30 watts of the conservatively rated 100 w into 8 ohms before switching into class 'AB'. Rather too many 'hi-end' companies would market such a beast as 'pure class A', Korato are a little more honest. But the muscle credentials go rather further than this. 200w into 4 ohms and 350 into 2. Nothing I can think of at the price beats it. But then if you cut a lot of corners it's no big deal except that the Korato is packed with designer components. First it's dual mono. I don't mean it has two output stages, I mean that if you took a hacksaw and cut it into two it'd still work. 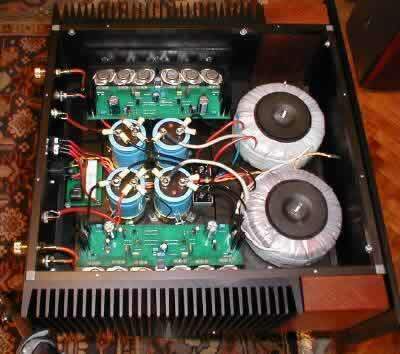 Sure the front LED is shared and so is the power cord but apart from that everything is doubled and symmetrical, two monoblocks in a single case - two custom 500va toroids, each channel having two monster capacitors giving 72,000 uF (144,000 uF total) made by Cornell Dubilier in the US. Three pairs of metal canned Motorola transistors per side are bolted to serious heat sinks. The whole shebang wired with VDH cable. The casework is solid and impressive. An 8mm black alloy frontplate carries the logo and an LED. The chassis is steel square section tube to which are bolted the aforementioned heatsinks which take up a side each with a section of wood trim to lift it from the ordinary. It's not beautiful or sculpted, just purposeful and well put together, sort of 80's Krell meets Scandinavian understatement. Speaker binding posts and phono sockets are quality gold plated items. The power switch is on the back, which is a fiddle but leaves the front 'clean'. The KVP10 is a bit special too… Using the same casework design, but this time much shallower, this is a two box design. One box holds the valve regulated power supply, again dual mono with two 50va toroids. This feeds the pre via two umbilical cords. Inside is a mu-follower based hybrid design using zero feedback, again all dual mono. Using Hovland polypropylene caps, a Noble pot, a Swiss Elma selector with all gold plated contacts, VDH wires and EI-RC premium valves it's another name dropper. So what is the real purpose of all that power, and especially in the Koratos case, the ability of that power to double and quadruple as the load presented by the speaker reduces? Well some speakers are very inefficient, remember that the power required for a given volume doubles with every 3dbl reduction of efficiency in a speaker. Thus if a 90 dbl speaker needs 10 watts to go loud. An 87 dbl will need 20 watts, 84dbl - 40 watts, 81dbl - 80 watts and so on. So if your speaker is resolutely inefficient those 100 watts may come into play more often than you'd think... But that's an extreme case. Nowadays your average speaker is going to have an efficiency around 87 dbl, though there's a huge variation. My own IPL S3tl's are around this figure and my Audion's 30 watts are just enough to get them to really rock, though there's nothing in reserve. This combination works so well because the IPL's are an 8 ohm speaker and like most transmission lines have a gentle impedance curve. And this is the problem with other speakers. Many, perhaps the majority, treat the 8 ohm standard as a loose guide. A typical ported speaker will have a roller-coaster impedance curve which will swing from say 10 down to 4 ohms, and that 4 ohm trough is usually in the low/mid bass region where there's a lot going on. At that 4 ohm point the speaker will be demanding twice the current from the amplifier, otherwise the speaker will alter the response of the amp by going 'quieter', or at best loosing control as the amp works up a sweat at that particular frequency. This is a typical scenario, real ball breakers like Shahinian's, full range ribbons and the like will dip to 1 ohm! Next a warning. The pair sounds dreadful straight from the box. 48 hours burn in being necessary. But it's worth the wait. If you are looking for the archetypal 'valve sound' - warm and cosy - look elsewhere. Both pre and power, despite their different technology share the same characteristic of an amazingly open, dynamic sound. I had thought my Audions would be an easy match, especially the pre amp, but no. The single most striking difference was the much bigger and especially deeper soundstage. They made my Audions sound 'small' and you've no idea how cut-up that makes me feel. If the Lab 47 sounded a little flat and undynamic compared to the Audions with all but the most efficient speakers, the Karatos were that much more dynamic again. They are so clear and detailed that at first I feared they might be too 'pushy' for their own good. A fine test for this is to put on Nirvana's 'Nevermind' and turn the wick up. I expected the odd wince but instead it just got seriously loud! The bass control was superb, a notch above my old Naim 140 and two above the Audions. And all the time that big, rock-solid soundstage. These amps just loved my IPL's, taking their prodigious bass capabilities to new heights. Marleys 'Real Situation' showed fast dubbed bass and a drum kit back in the mix. The soundstage on 'Time out' was huge, echo's from the back wall of the studio (real or manufactured?) better than I'd ever heard. Playing 'swaps' with both pre and power showed ever more clearly the difference. The powers were fairly evenly matched, the Korato harder, faster and with considerably better bass control, but the Audion ETPP's sounded warmer and more laid back, both were excellent and the Korato better with the IPL's but I could see other speakers pushing the verdict the other way. However dial in the 4* advantage in power and driving ability and the Koratos had it by a head. The pre's were where the real difference lay. The Audion was creamy and smooth and if you listened carefully didn't give any detail away. But the Korato… Here was the source of that amazing soundstage, the lightening speed and attack, the space around instruments… The result was slightly drier, but simply better - it screamed 'high-end' at you. Remember the Korato is about 60% of the Audions price, itself a pre I'd considered as near perfect as makes no difference. I'm going to take a lot of convincing that there is a better pre than the Korato - anywhere - at anything like the price. And when the going gets tough? Here a further comparison with the Audions was interesting. As I've said before they have a smaller, warmer and slightly softer presentation. As the volume goes up they fill out and just get better and better, really boogying along. When the sound level gets to party time the sound begins to thin out as the amp just runs out of steam in the bass, things become harsh and congested. The same test with the Korato showed much less change in balance, the sound just getting louder and louder to the point where I feared for my hearing and the speakers ability to deal with the heat generated - ultimately we're talking reserves of power. One weakness of many muscle amps is a lack of speed and timing, sort of big American muscle V8, great in a straight line but don't try to turn corners or stop. But once again Los Lobos 'Be Still' bounced along - no problems - top marks. The phono stage was obviously doing it's job but putting on a CD of the Christains 'Happy in Hell' showed that with soundstaging to burn it could conjure stage depth and width from the little silver disc that previously I'd not thought possible. "Say it isn't So" showing that even modern popular music can benefit from such insight, a lovely buzz to the bass as the amp gripped the speaker cones like a rotweiler on a postman's leg whilst every production technique was laid bare. There are lots of odd percussive sounds at the edge of the mix and each of these was shown to be distinct and different. Then back to the 'A team' and all the while I was hearing little fills and details I'd not heard before. When Madonna sings "Let the choir sing" you know what she means. Likewise the 'Grande Casse' in the opening of 'Rapsody in Blue' felt suitably big yet way back in the orchestra. The combination of Orbe/Korato/IPL really gave the impression of being in the control room, nothing missed, you could almost hear the sliders going up and down. It was interesting that both pre and power shared a slightly dryer balance than my Audions, this consistency is admirable, all too often a warm valve pre-amp is used to cover for a harsh power-amp. The downside of this is that when I put on the Cabasse Sloops the result was just too bass light and mid forward. A lot of fiddling with cables and placement could probably redress the balance but to be honest I was having too much fun using the IPL's to be bothered. But if your system is already forward and pushy the Koratos aren't going to help the situation, better to stick with something warmer. This isn't a criticism of the Koratos, just an acknowledgement that they're not going to make up for mistakes/unbalance elsewhere. The bass is there, dry, fast and seemingly bottomless but they're not going to smooth over an aggressive system. In fact they cry out for full-range, (i.e. good output at 25 hz), speakers to show their true colours. And as for absolute quality, tonal balance can be fiddled with using placement, supports and cables, but no such fiddling is ever going to give a lesser amp the sort of soundstaging, control and detail the Koratos possess. That said there is some scope for tuning the pre-amp by changing the valves. As well as the EI-RC valves supplied I was given a pair of Telefunken valves which managed to fill out the sound and so sound less clinical, which you'd prefer will depend on the balance of your system. But for me they're not 'background listening' amps, in fact I found it very difficult to read whilst they were on, they just kept tugging you back to the music with new surprises, extra details, sounds coming from places you don't expect. The general build quality of both pre and power is excellent without being 'over the top'. There are two exceptions. First the power amp top cover is made of thick sheet steel, it's good quality but it rattles when touched. A small stiffening bar or a damping pad would make it feel much better. As for the pre-amp, the control knobs feel plastic, though actually made of anodised alloy - no I can't explain it's just how they seem to me. Operational feel for the volume pot is fine, for the input selector it's a bit vague due to drag in the way the long shaft is mounted. These are trivial points I know, but in a marketplace where perceived value and feel are so important it's 'spoiling the ship for a hap'orth of tar'. In 1987 Korato had distributors in Europe. Now after all that has happened those links have been lost -so though IMHO the pairing here is an absolute bargain, you can't buy them... Sure until they have a distributor you can visit their website and order direct and with a considerable saving, but with no back-up outside Yugoslavia it's a risky business. Normally reviews on TNT are aimed at potential buyers, to inform them, sometimes encourage them and more rarely to warn them off. This time I hope potential distributors are reading... That said I would be very surprised if Korato was left without a distributor in Europe for more than a few weeks. Of all the amps I've had in my system of late, these are my personal favourites, they just make me want to play music more than anything else I've heard, and for the first time that includes CD's. Other listeners or systems may prefer something less literal, but for me the Korato pair are to amplifiers what the Loth-x Polaris were to other speakers I've heard lately - real 'high-end'. The difference being that the Polaris were three times as expensive as anything else I had to hand, the Koratos are cheaper than all the other amps… That they are also capable of driving anything they are likely to meet is the icing on the cake. Costing £1000 less than my own amps and comfortably outperforming them with my IPL's makes me jealous of the lucky future owner of this pair. At the moment I can't think of anything to touch them at the price. The Koratos are a class act - period. We would like to thank Geoff Husband for such a honest and detailed review of our products. Our sincere thanks also go to the TNT-Audio site that has given us the opportunity to present our company and our products and have them tested by an independent reviewer. The Korato company, as Geoff stated in his review, has been around a while (established in 1988) and we feel that such a smashing review is well deserved as we worked hard to make our products as good as they are now. During the course of these years I spent a lot of time talking to Korato users. While personal tastes vary, one thing we all agreed on is that the reason they buy HiFi equipment in the first place is to listen to music. This is the reason we designed the KTA 100/KVP 10 combo, to make listening to music as enjoyable experience as possible. We want the customer to enjoy this experience. 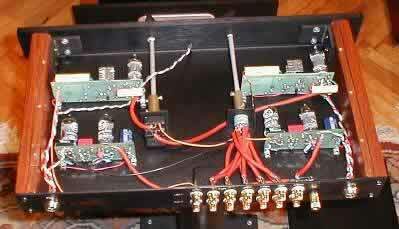 This combination was designed to be at home in as wide variety of HiFi installations as possible. As Geoff did such a fine job of identifying the true nature of the KTA 100/KVP 10 I feel that there is not much more that I can say. I am particularly glad that Geoff has emphasized the value for money factor that Korato products offer. This has always been our main objective: give more for less without sacrificing the quality. I think that we succeeded.